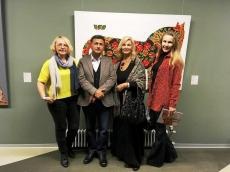 An exhibition of Azerbaijani artist Vugar Muradov opened in Erarta Museum in Saint Petersburg on October 7. The museum displays Muradov’s series of paintings based on the motives of the national carpets and carpet-weaving traditions of different schools - Baku, Ganja, Gazakh, Shirvan, Shamakhi, Karabakh, Guba, Ardebil and Tabriz. The artist carefully studies the ornamentation and patterning to draw out the delineations of conventional figurative compositions that go unnoticed by the unfamiliar eye. He then mentally blanks out the rest of the design and thus has a whole new image. All that remains is to apply his brush and reproduce it on canvas. Vugar does all the work manually with resort to printing. In his carpet series, artist creates an unexpected synthesis of two conceptual approaches to visual composition, Eastern-Islamic and Far Eastern-Buddhist. This interesting and productive synthesis brings stylistic unity to the modern art of a diversified East that, being based on entirely different religio-philosophical traditions of Eastern art, has been unimaginable up until now. In other words, we witness a symbolic engagement of “the two Easts”. The exhibition will last until October 22. Muradov’s paintings are mainly bought by private collectors and the world’s most famous museums, including the Guggenheim Museum in New York and the same city’s Museum of Modern Art, the Argentinean company Guevara Films, the Central and Eastern European Art Foundation in Washington, the Sasakawa Peace Foundation (Japan). They embellish the offices of the Baltimore Sun newspaper (USA), Turkey’s Ministry of Defence, the Lambri International company (Holland), the Peace Foundation, the French embassy in Azerbaijan and many private collections around the world. This year Azerbaijani artist became a member of the UNESCO International Federation of Art.